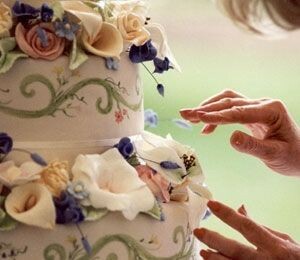 The history of wedding cakes is a long one… The tradition of the bridal – wedding cakes dates back to the Roman era. Certainly the Romans were not in the habit of baking elaborate or elegant wedding cakes with buttercream icing and custom wedding-cake toppers. Usually they used loaves of wheat bread. The loaf of bread was broken over the heads of the newlyweds to bring them luck and prosperity. Sometimes it was broken only over the bride’s head, usually by the groom. The crumbs of wedding cake, that landed on the floor symbolized good luck and fertility for the bride and groom, and it was considered good luck for guests to eat the crumbs of “wedding cake”. Single women scrambled for the grains to ensure their own betrothals. During the middle ages the bridal – wedding cakes were simple biscuits or scones. At that time each guest brought one small bridal cake to the wedding (somewhat bigger than cupcake wedding cake of nowadays). They were piled on top of each other, and the bride and groom had to kiss across the top of the piled cakes to bring them good luck in their marriage. The history of wedding cakes goes on: In the seventeenth century French bakers stacked the wheat buns and coated them with icing. This was the beginning of new history of wedding cakes, they start looking like ours. The typical wedding cake today is composed of several cakes stacked in layers and the whole thing covered with icing. Shapes range from: square, round, rectangular, heart etc… But there are so many options and design ideas that it can be difficult to choose the one that is just right for you. You would also like to keep the wedding cake price at the reasonable level, while having elegant and classy cake. In the past, wedding cakes were considered a symbol, and everyone wanted the same bland white cake with white icing because that was the symbol. Luckily, the days of those boring wedding cakes are past. Today’s bridal cakes can be a culinary and design extravaganza. The bride creates or finds a design she likes, and the caterer hires a bakery to create her unique wedding cake or bride does it herself. At the reception the bride cuts the first two slices with the groom’s hand placed over hers. The groom feeds the bride the first slice and then the bride feeds the groom the second. This symbolizes the support they will provide to each other. This history of wedding cakes taken from Cake Channel.